From the Oscar-nominated team behind the genre-defying Embrace of the Serpent comes an equally audacious saga centered on the Wayúu indigenous people during a crucial period in recent Colombian history. Torn between his desire to become a powerful man and his duty to uphold his culture's values, Rapayet (José Acosta) enters the drug trafficking business in the 1970s and finds quick success despite his tribe's matriarch Ursula's (Carmiña Martínez) disapproval. Ignoring ancient omens, Rapayet and his family get caught up in a conflict where honor is the highest currency and debts are paid with blood. 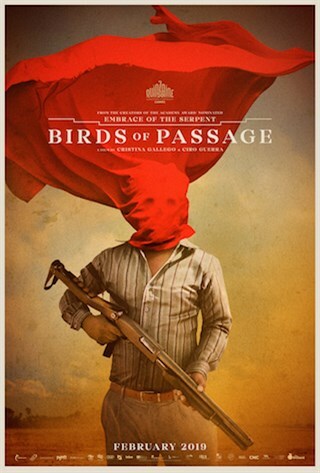 A sprawling epic about the erosion of tradition in pursuit of material wealth, Birds of Passage is a visually striking exploration of loyalty, greed, and the voracious nature of change.